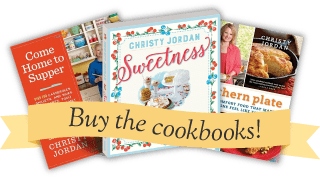 It wasn’t until a phone call I had with someone in New York last week that I realized most people consider slow cookers to be for fall and winter dishes. From reading my Facebook page, though, I know that most of us (you and I) LOVE our slow cooker in the summer time. There is nothing like having supper ready on a day when it’s 100+ degrees outside and not having to turn on your oven. A slow cooker sure does keep your kitchen a whole lot cooler! So today I’m bringing you my latest slow cooker recipe that I dreamed up last week. 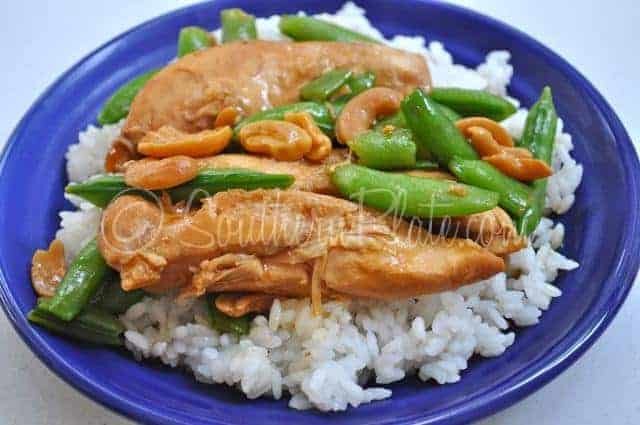 I love chicken teriyaki and I also love cashew chicken so a combination of my favorite ingredients turned out to be a supper that I loved so much, we’re having it again tonight :). Before we go into that though, lets talk about your weekend. Did you have a good one? 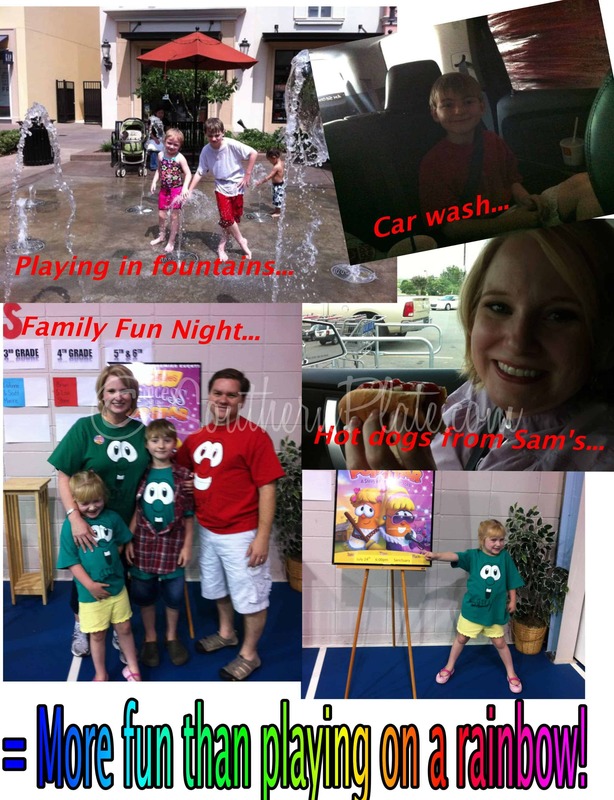 Ours involved a trip to Sam’s club, a drive through the car wash, and taking the kids to play in the fountains at a local shopping center. On Sunday we went to church and then participated in our church’s first family fun night last night where we all got to watch the premier of the Princess and the Pop Star, the latest VeggieTales movie. After that we had an ice cream social in the church’s gym. I thought our weekend was fun, of course, but since we didn’t travel anywhere or do anything specifically planned it seemed low key to me (I’m used to planning these big Hallmark moment weekend adventures, I can’t help it). I realized I was very wrong this morning when Katy got up and said “Mama, wasn’t this weekend a blast? It was more fun than playing on a rainbow!”. Wow! More fun than playing on a rainbow? Now THAT is some kind of fun! Folks, Katy is right, this is the life! 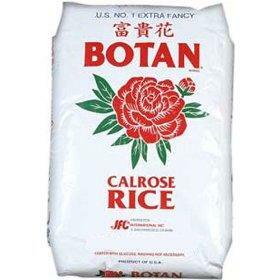 This is my favorite rice. You can get it near the Asian foods section, it usually isn’t near the regular rice. It’s kind of almond shaped and a friend of mine who is from Korea refers to it as “sticky rice”. My Mama (and consequently myself) was raised eating rice for breakfast. We like to take hot rice and stir some butter and sugar into it for a quick breakfast, lunch, or even a sweet evening treat. I call it sweet rice and this brand makes the best on earth! You’ll also need some type of veggie to toss in there towards the end. Go with what your family likes. I just used these. I put them in the microwave for about two minutes, just enough to thaw them out a bit, then poured them in the slow cooker. One box was plenty and they are so good! 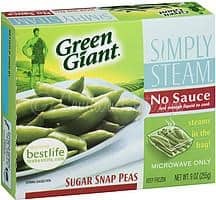 You can also use fresh sugar snap peas if you like or any other vegetable that cranks your tractor. Place your chicken in your slow cooker. 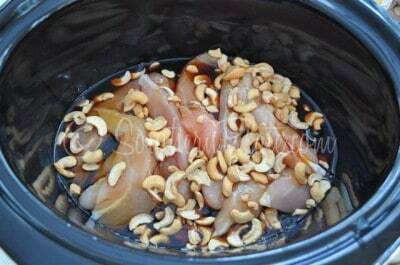 Pour in one cup of teriyaki sauce and add in your cashews if you want them to be cooked and tender. *If you prefer your cashews to stay crunchy, add them in the next step. Lots of folks might prefer water chestnuts or even peanuts to cashews. If that is you then go for it! Water chestnuts make me cringe every time I bite into one so I try to avoid them and really only use them in my cooking when I make Chicken lettuce wraps(click here for that recipe), but they’re diced pretty fine for that so they aren’t as noticeable. After your chicken is fully cooked, add in some sugar snap peas if you like, or other vegetables. Stir that up and cover again until your veggies are tender. This supper is easy, delicious, and easily customizable for your family. Place chicken in slow cooker. Add sauce. Add in nuts if you prefer them tender but if you want them crunchy wait until step #3. Thirty minutes before serving add in thawed vegetables and nuts (if you didn't in step #1). Cover and cook another thirty minutes. Enjoy this moment, for this moment is your life. I’ll be speaking at the Huntsville Public Library on August 27th. Please click here to visit my facebook page for that event and rsvp if you can come so I can be looking for ya (I love to recognize faces!). I’d love to be able to travel more to meet all of you but my personal budget and family time with all that I have going on right now just doesn’t allow for that. In the meantime though, my grateful heart is with you and I sure do appreciate you visiting with me here on Southern Plate! but ended up being more fun than playing on a rainbow? My cousin puts her slow cooker on her covered porch and then has even that bit of heat out of her kitchen. She also fixes her iced tea by the gallon early in the day and puts it in the freezer so that it will be slush by mid afternoon and requires less ice. Isn’t she clever? I use my slow cooker all year. Especially when it is so hot. NC is brutal right now. This recipe looks just fantastic. Come over and visit us. We have a really wonderful grilled squash recipe today. Sounds like a great summer supper….but best of all is your mention of rice for breakfast!!!! I love it with sugar and butter…I just can’t seem to convince my husband that (1) rice is for breakfast and (2) it should have butter and sugar on it! (I also can’t convince him that tomatoes and gravy are great with biscuits….of course for breakfast!). He doesn’t know what he’s missing! Thanks for making me smile! I have a QUILT quote for you, Christy. No idea of the source. The World is a quilt, each of us a tiny stitch placed with love and care by the maker, with the sole purpose of holding it together for generations to come. Love me some sticky rice, that is a korean thing along with mondu. i will have to try this recipe, my son has been hungry for teriyaki. never thought of slow cookin’ it. I have a bottle of garlic teriyaki that is so stout it would ward off vampires for a country mile! I was just trying to figure out something to put in the slow cooker for dinner tonight (something with chicken)… I am so happy to have seen this on FaceBook!! Can’t wait to try it! Thanks, Christy! I’ve never heard of eating rice for breakfast, but it sounds good! I love my slow cooker. I made a pretty good chocolate cake in it once too! Sure do miss your postings on my Facebook page and in my e-mail. I realize you’re really busy, but all of us out here really really miss your posts and stories. When is your life going to slow down so we can enjoy you again? One of the highlights of my days would be if you had sent a post with a video from home. I wonder what Fb page you’re going to? I post several times a day on my fb, beginning with a good morning message each day. I also send out three to four emails each week and always have, but that will understandably slow as I get into writing my next book. We’ve been here all along and would love to have ya back with us again! Christy, I’m with Wendy. I sent you an e-mail last week and tried to re-subscribe. I am not getting any of your “daily” e-mails. 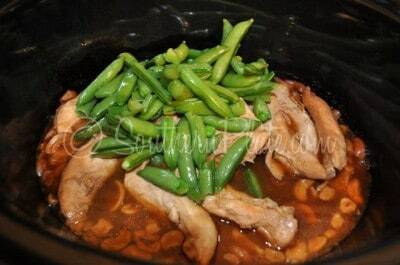 I have to go into your website to see what you are posting; ie, this chicken teriyaki recipe did not show up in my e-mail. I had to go into your website. I’m not sure what is wrong, but like Wendy, I miss seeing your posts show up on my e-mails. Do you suppose there are some gremlins at work? Hey Janice! I responded to Wendy just a bit ago via email and I sent you an email last week in response to yours. Can you check your junk folder? I was sure you’d gotten my email last week and I went in and found your subscription and made sure it was on the up and up. I think most likely your email program is viewing southernplate.com emails as spam I’m afraid, which has to be fixed on your end. You can go in and “unflag” them as spam or enter in my email addresses as “approved” in your program. I don’t think gremlins are at work but I would not be shocked if we found a few :). What I’d really like is some elves though! Christy, did you find that Calrose rice in Walmart, too? I love rice, that one sounds good! You know, I have an empty fridge (It’s grocery shopping day), but I do have chicken in the freezer and teriyaki in the cupboard…it’s on! I misread what Lindsay wrote and thought she said she had children in the freezer!! LOL!! I sure did a double take, Lindsay!! Christy, I don’t think that this recipe could be any easier! Can’t wait to try it this week!! Thanks so much and keep em’ coming!! If you wait to stir in the cashews until just before serving, they will remain crisp. Cooking them tends to make them rubbery! I know what we will have for dinner tomorrow night. In fact, there will be enough to share with the folks next door. We are out of cashews AGAIN – can’t seem to keep them – they disappear like they are chocolate around here. Today is a “get it done in the house and garden day” so won’t shop until this evening. Hubby and I both love Cashew Chicken and Teriyaki Chicken, so my mouth is watering already! Have been having your iced coffee on these hot summer mornings. I’ve learned that 2 1/2 packets of Splenda does it for me and I add a tad of chocolate syrup for the mocha I crave. Love your posts almost as much as I love you! Rice with butter, a little milk (or half and half) brown sugar and cinnamon is how we grew up eating it for breakfast. I love cooking rice in my microwave, keeps the house cool, and is sooo easy. I bought a bunch of boneless skinless chicken breasts the other day on mark down, and came home and threw them in the crock pot. Now they are in bags in the freezer for quick and easy dinners. Then last night I did the same thing with a half priced pork loin from Aldi. So good. It will be dinner for a couple more nights. Love my crock pots. Another great idea, Christy. I think some mushrooms would also be good in this. Also maybe some green onions, chopped. I would add both about 30 minutes before serving. You are the greatest! My Cuban husband thinks that it is heretical that I eat butter and sugar on my rice. He just looks at me and shudders. I’m glad I’m not the only “heretic” out there! I love my slow cooker, wouldnt know what to do without one. This recipe looks really good, i will have to try it soon. 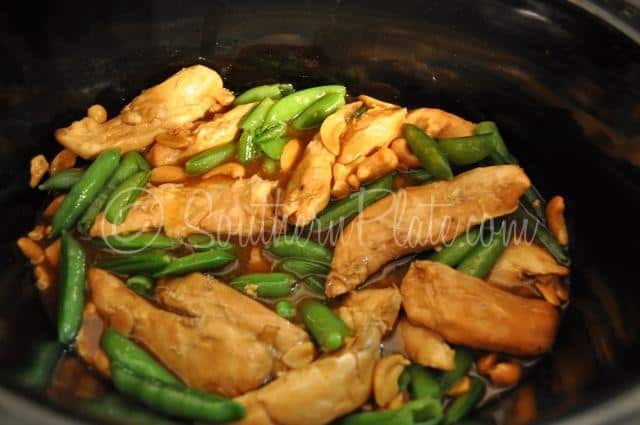 Teriyaki sauce is easy to make from scratch: I use multiples of 1/4 c. each of sugar,soy sauce ( I use low sodium),and cooking sherry (or rice vinegar),and 1 tsp. ginger, 1 Tbs. oil.and mix. So for a cup double first 3 ingred.. my family likes to soak their rice in the sauce so I usually do 3/4 c of each. As for rice for breakfast we always had brown sugar, cinnamon, and milk–yummy. Man – does this sound good!! Mushrooms and chopped green onions sound like the perfect addition here. I’ll have to get some of these items on my next shopping list. We ate rice for breakfast as kids but my mom added raisins and we ate it with milk and sugar like oatmeal. I use rice as a single serving side dish as I live alone. Sprinkle hot cooked rice with butter or olive oil and some salt, pepper and garlic powder. It makes a nice change from a potato and if I have any little bits of leftovers such as peas or mixed veggies I toss them in too. 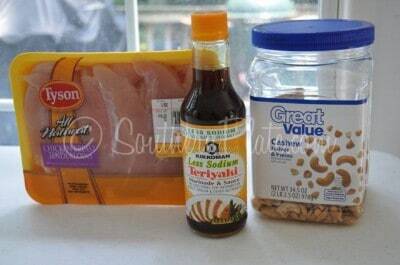 Add diced chicken or ham and I have an all in one lunch that is quick and easy. Another easy dish with cooked rice is too stir it into a couple lightly beaten eggs with any leftover meat, and veggies you might have and saute in butter till eggs are set. I love to add diced onions and bell peppers and maybe some mushrooms. Can vary widely with the add ins. Try bacon and cheese. Your creativeness can run wild! I grew up in the “rice capitol of the world” and NEVER had rice any way except with butter, sugar and cream /milk. I was astonished when I went off to college that we were served rice with gravy instead of mashed potatoes and gravy. I must add however, I think others who grew up when I did, had rice a lot of different ways. Apparently, my family thought of rice as a cereal-type grain. I agree with Vikki I think I would like green onions and mushrooms in this. My slowcooker has been a blessing in this heat wave. I have really been bad about wanting to cook and it is much cooler to use my slowcooker than my oven or stove top. Have you ever used liners for your slow cooker? They are absolutely wonderful. Makes clean-up a breeze! I find them in the aisle with waxed paper and aluminum foil. I’ve never had rice with butter & sugar before. I did have some friends that were from Iowa and they said that when they came to Florida they tried grits for the first time and loved them. I asked how they ate them and they said with milk & sugar instead of the usual butter & salt. Bless their pea picken’ souls, they just didn’t know any better!!!! Hey Christy, This recipe looks fantastic and SOOOO easy. My mouth is watering just looking at the pictures. I have been at my daughter’s for 3 months and she doesn’t have a slow cooker. I am going home soon–back to MY bed, MY special chair in the living room, and MY kitchen and SLOW COOKER!!!!!! (Not that I haven’t loved being with my daughter and grandson). This recipe will be one of the first things I make after going home. Oh, and the sweet rice–I was in my 20’s before I ever had rice as a side dish and not a breakfast cereal. In fact, I may make some this evening as a treat for daughter and grandson!!!! My best friend is from Hawaii and introduced me to Calrose (sticky) rice about 20 years ago. It is the best. She also shared her recipe for homemade teriyaki sauce, which we use to make teriyaki steaks and burgers. It is FABULOUS! Let me know if you’d like to try it. I can hardly wait to try this cashew chicken recipe! Yum! Would love to know your homemade teriyaki sauce recipe. Sounds delicious! Thank you! My husband is a Pipeliner and we travel with him alot and cooking in a 5th wheel travel trailer gets hot QUICK. I LOVE to use my slow cooker when we are out on the road with him. That lil gas stove heats up that 40 ft trailer way too fast for me and a slow cooker is a must have item.